You are at:Home»Husky Guides»What Is A Siberian Husky’s Natural Habitat? What Is A Siberian Husky’s Natural Habitat? If you’re considering buying or adopting one of these beautiful dogs, you’re probably wondering exactly what a Siberian husky needs to live a great life. Their name suggests that nothing less than the harsh cold climate of Siberia will serve as their habitat, but the truth is that they are just as happy to live in warmer environments. In fact, you can find huskies enjoying life in all types of climates around the world — from Siberia to Singapore! But while these dogs are very adaptable to different environments, it’s still important that you make sure your house or apartment is husky friendly so your pet can quickly adapt to their new home. We’ll run through how you can make your home fit for a husky and — in order to keep them happy and healthy — the best exercise for a Siberian husky. What is a Siberian Husky’s Habitat? Siberian huskies were originally bred by the Chukchi people of Siberia to ultimately pull sleds across miles and miles of frozen ground. Basically, they were bred to be working dogs, as well as herd animals and perform as watchdogs. Not quite the domestic pets they are today! So — what is a Siberian husky’s habitat? Their natural habitat is a cold, northern climate, but that doesn’t mean they can’t survive in warmer conditions. Quite the opposite in fact. Even though they have a thick double coat to help withstand harsh weather, they have now become a popular breed in virtually every corner of the globe. A good habitat for a husky is one where there is lots of space to play, roam and exercise. It’s also a good idea to provide a husky with plenty of toys. Otherwise, you may find them chewing on your curtains and other furnishings! Huskies, like many other dog breeds, are den animals. Crate training is a great way to help them create a den and to toilet train them. Huskies love the company of humans too, especially those who have lots of energy like themselves. Make sure that you spend plenty of time with your Siberian to ensure that you bond properly and that you can establish yourself as the Alpha of their new ‘pack’. One of the best ways to spend quality time with your husky — and undoubtedly the best way to keep them healthy and their behavior in check — is to make sure that they have enough exercise every day. If they’re getting enough exercise, and spending enough time with you their owner, your husky will be happy in any environment they find themselves in! Without question, you must give a husky ample daily exercise. Whether it be a long walk or run, you need to take this dog breed out every day for at least 30 to 45 minutes, as well as incorporate extra games and play to exercise their mind. If you can, we’d recommend taking your husky out 2 to 3 times a day. This amazing breed can actually run tirelessly for miles, so it’s perfectly fine to take them with you on a long hike or jog. As a very energetic animal, it’s unwise to allow a husky to do any outdoor physical activities without a leash. If you let them run freely, they are unlikely to return. Also, plan to take them for extra-long walks during colder months, as they really thrive in the Fall and Wintertime. Exercise helps your husky maintain proper growth, strong bones and a healthy heart. Just like humans, lack of exercise can greatly affect a husky’s health and lead to problems including weight gain, diabetes and bone joint issues. Not to mention a host of behavioral problems. This breed of animal also gets bored easily and needs to find ways to burn off energy. Without proper exercise, a husky can indulge in destructive chewing, become overexcited around humans, and whine all the time. 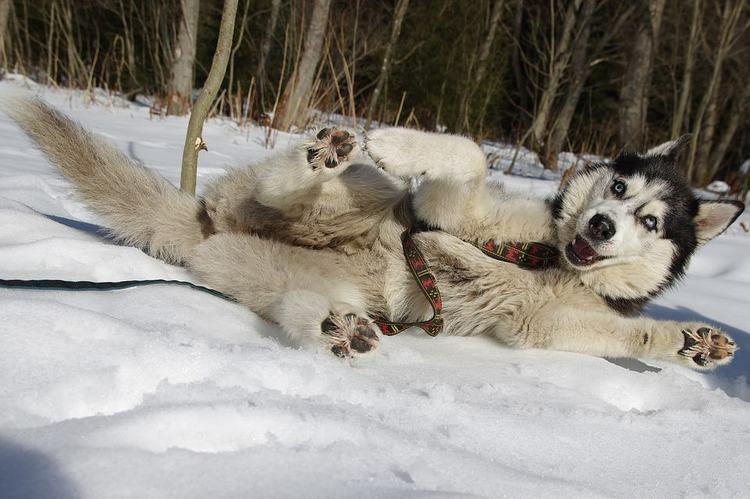 When it comes to the best exercise for a Siberian husky, you have lots of options. They will be naturally talented at sledding type sports, but this may not be possible depending on where you live. Walking and running long distance are great for a husky, and are things you can do just about anywhere. Whether it be at a park or in your backyard, your husky dog will make the most of every minute of their time spent outdoors. You should also consider playing fetch and Frisbee while encouraging your husky to bring you back their toys. Mentally challenging games such as hide and seek work just as well, as does cart pulling. As previously mentioned, you can also take them out on a long jog or hike and let them join in with your personal exercise regime. As a very independent animal with a desire to roam, it’s crucial to provide a husky with daily training to help them adapt to situations and experiences. Just like exercise, setting a routine is best and you can incorporate exercise and play into their training to maximize your time together. Would you like to own a husky?